Here are 10 well-known, classical Japanese stories you can add to your repertoire of traditional Japanese knowledge. If someone asked you to tell them a story, what would you say? Most people probably wouldn’t know where to start. Do you tell a traditional story, something everyone knows, or do you make up an original one? Do you rely on fairy tales and legends, or do you mix them up to make them new? Whatever you choose, chances are your story is somehow influenced by the stories you heard and learned as a child and have stuck with you until now. 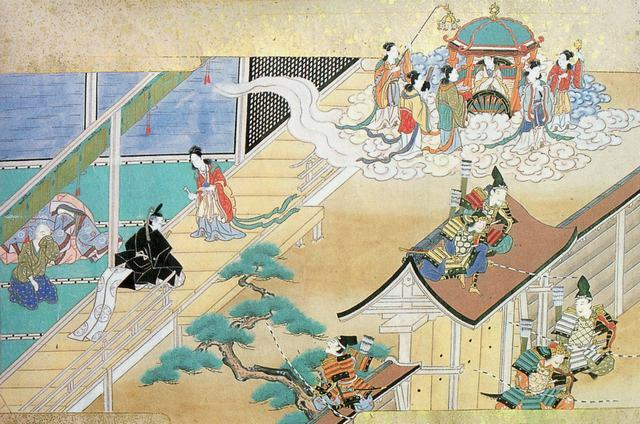 Here are 10 classic Japanese stories. While you could technically call them folktales, some are more like legends and others are more like fairy tales. Most Japanese people know a lot of them, if not all, and they are also sometimes taught in Japanese culture and language classes. According to the present form of the tale (dating to the Edo period), Momotarō came to Earth inside a giant peach, which was found floating down a river by an old, childless woman who was washing clothes there. The woman and her husband discovered the child when they tried to open the peach to eat it. The child explained that he had been sent by Heaven to be their son. The couple named him Momotarō, from momo (peach) and tarō (eldest son in the family). Years later, Momotarō left his parents to fight a band of marauding oni (demons or ogres) on a distant island. 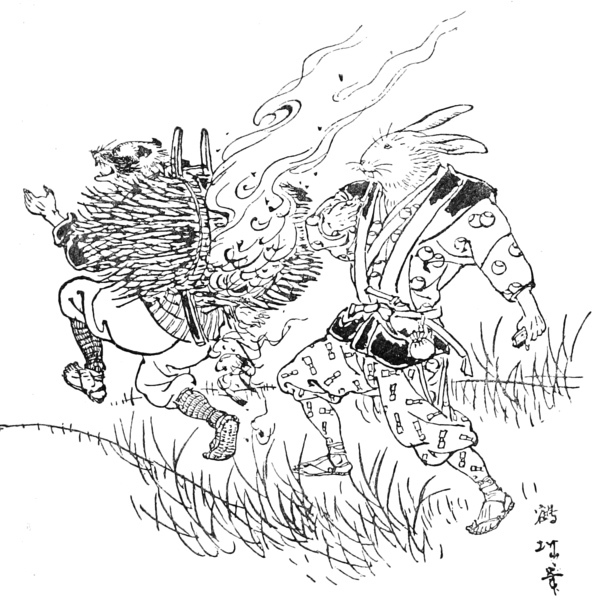 En route, Momotarō met and befriended a talking dog, monkey, and pheasant, who agreed to help him in his quest. At the island, Momotarō and his animal friends penetrated the demons’ fort and beat the band of demons into surrendering. Momotarō and his new friends returned home with the demons’ plundered treasure and the demon chief as a captive. Momotarō and his family lived comfortably from then on. 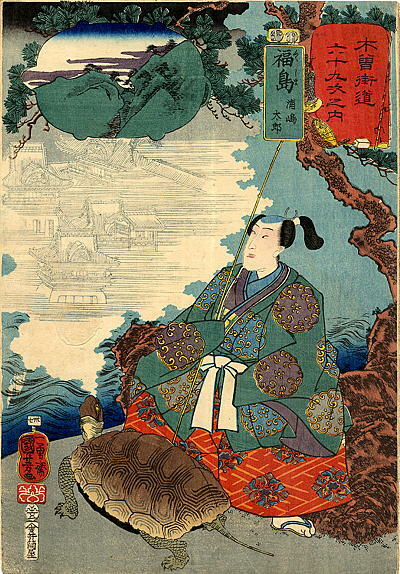 The story of Urashima Taro, the name of the main character, is about a fisherman who rescues a turtle and is rewarded with a special trip under the ocean to visit the kingdom of the Dragon God. The princess gives Urashima Taro a box and tells him that as long as he does not open it, he will stay happy, but of course, he opens the box when he returns to land. 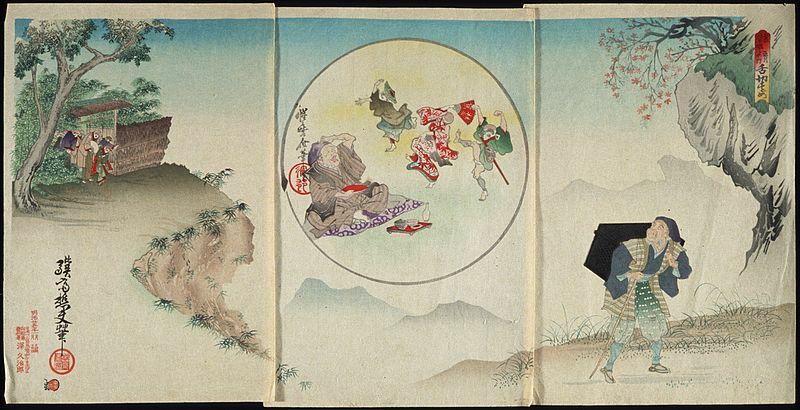 Urashima Taro, a Japanese tale teaches the importance of obedience over happiness. A sea turtle rewards a fisher, who is, in turn, punished for disobedience. Kaguyahime, also known as The Tale of the Bamboo Cutter, is another popular tale. Although it has been adapted into other formats several times, its most recent adaptation was an animated film done by Studio Ghibli. It primarily details the life of a mysterious girl called Kaguya-hime, who was discovered as a baby inside the stalk of a glowing bamboo plant. She is said to be from Tsuki-no-Miyako (月の都 “The Capital of the Moon”). 6 Famous Yokai, Mystical Creatures From JapanIn Japan, mystical creatures such as monsters, ogres, and fairies are all called yokai. The connection between tokai and Japanese people is deep, and the religious and cultural belief that Japanese people have are often coming from the awe and respect for these spiritual beings. Here are some of famous and interesting yokai in Japan. Kintaro, known as “Golden Boy,” is a popular story among children, though it is well-known with all of Japan. While there are many versions of the story, the main premise is that Kintaro is a boy with super-strong powers who was brought up in the forest and became friends with several animals. Kintarō, also known as the Golden Boy, is one of Japan’s popular folk heroes. He has been featured in many anime and manga such as One Piece and Otogi Zoshi. In many ways, Kintarō was like Japan’s Tarzan, having been raised in the wild and battling different sorts of weird creatures. 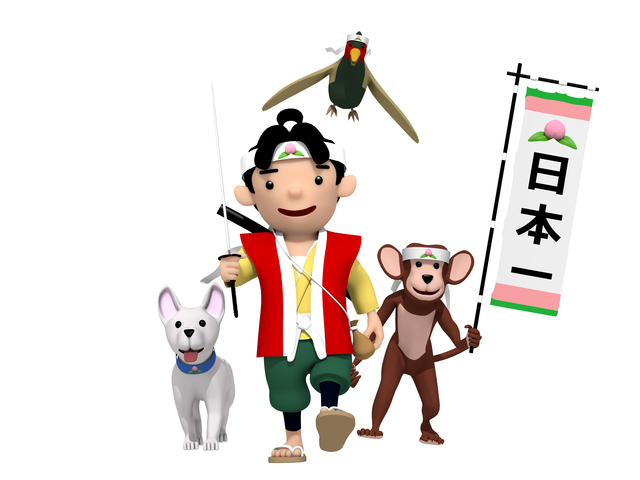 The story of Kintarō is said to come from the desire of parents to have their young boys grow up with strength and courage, just like the folk hero. While you may know Tanabata as the Star Festival that takes place around July 7 (or August 7, depending on the area), the story of Tanabata is also a classic tale. There are several versions of it, as is common with old stories, but this is the most famous. 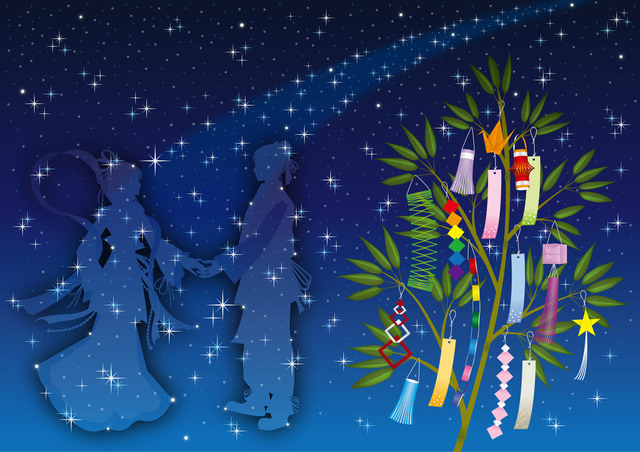 Tanabata originated from a Chinese legend called Qixi and was brought to Japan in the 8th century. This is the story of two lovers. Princess Orihime, the seamstress, wove beautiful clothes by the heavenly river, represented by the Milky Way. Because Orihime worked so hard weaving beautiful clothes, she became sad and despaired of ever finding love. Her father, who was a God of the heavens, loved her dearly and arranged for her to meet Hikoboshi, the cow herder who lived on the other side of the Milky Way. The two fell in love instantly and married. Their love and devotion was so deep that Orihime stopped weaving and Hikoboshi allowed his cows to wander the heavens. Orihime’s father became angry and forbade the lovers to be together, but Orihime pleaded with him to allow them to stay. He loved his daughter, so he decreed that the two star-crossed lovers could meet once a year–on the 7th day of the 7th month if Orihime returned to her weaving. On the first day they were to be reunited, they found the river (Milky Way) to be too difficult to cross. Orihime became so despondent that a flock of magpies came and made a bridge for her. It is part of the legend that if it rains on Tanabata, the magpies will not be able to find their way and thus the bridge cannot be made. “Bunbuku Chagama” means “happiness bubbling over like a teapot” (something like “my cup runneth over”). It is about a tanuki, a raccoon dog, who is rescued by a poor man and thus decides to reward him. 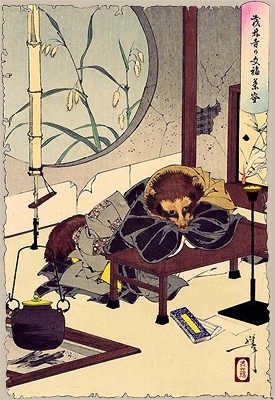 Tanuki are said to have shape-shifting powers, which are used in this story. 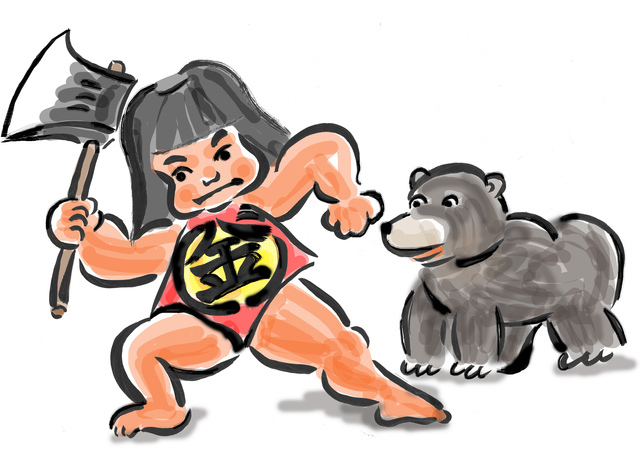 The story tells of a poor man who finds a tanuki caught in a trap. Feeling sorry for the animal, he sets it free. That night, the tanuki comes to the poor man’s house to thank him for his kindness. The tanuki transforms itself into a chagama(tea kettle) and tells the man to sell him for money. The man sells the tanuki-teapot to a monk, who takes it home and, after scrubbing it harshly, sets it over the fire to boil water. Unable to stand the heat, thetanuki teapot sprouts legs and, in its half-transformed state, makes a run for it. 17 Facts You Probably Didn’t Know About ShintoismJapan is a country home to many religions. But have you ever heard of the religious culture that started in Japan? Here are 17 facts to enlighten you on Shintoism! As the story goes, a man caught a troublesome tanuki in his fields, and tied it to a tree to kill and cook it later. When the man left for town, thetanuki cried and begged the man’s wife who was making some mochi, a sweet rice dish, to set him free, promising he would help her. The wife freed the animal, only to have it turn on her and kill her. The tanuki then planned a foul trick. “Shita-kiri suzume” means “tongue-cut sparrow” and is a very famous tale in Japanese folklore. It is about the consequences of greed and jealousy. The folktale “Tongue-Cut Sparrow,” often translated as “The Sparrow with the Split/Slit Tongue,” is a classic Japanese morality tale about greed and kindness. The old couple is rewarded in kind for their own actions, the man receiving both an enjoyable evening with his beloved sparrow-turned-human and a chest of gold, and the women receiving only snakes. “Issun-boshi” is about a boy who is one inch long. Thus, the story is often called “Little One Inch” or “One-Inch Boy.” As with the other folktales, there are also varying twists to the story, but the gist of it remains the same. The story begins with an old, childless couple who live alone. The old woman wishes for a child, despite her old age, “Please, please let us have a child, no matter how small.” Eventually, a son was born to them. But small indeed was the child—no larger than a grown man’s fingertip. They named the miniature child Issun-bōshi (Issun is a measure of approximately 3 centimeters. Bōshi means son). The child, despite being incredibly small, is treated well by his parents. One day, the boy realizes he will never grow, so he goes on a trip to seek his place in the world. Fancying himself a miniature samurai, Issun-bōshi is given a sewing needle for a sword, a soup bowl for a boat, and chopsticks for oars. The literal translation of the title is “flower-blossoming old man.” True to its title, it is about an old man who is able to make trees blossom long after they have died. An old childless couple loved their dog. One day, it dug in the garden, and they found a box of gold pieces there. A neighbor thought the dog must be able to find treasure, and managed to borrow the dog. When it dug in his garden, there were only bones, and he killed it. He told the couple that the dog had just dropped dead. They grieved and buried it under the fig tree where they had found the treasure. One night, the dog’s master dreamed that the dog told him to chop down the tree and make a mortar from it. He told his wife, who said they must do as the dog asked. When they did, the rice put into the mortar turned into gold. The neighbor borrowed it, but the rice turned to foul-smelling berries, and he and his wife smashed and burned the mortar. That night, in a dream, the dog told his master to take the ashes and sprinkle them on certain cherry trees. When he did, the cherry trees came into bloom, and the Daimyo (feudal landlord), passing by, marveled and gave him many gifts. The neighbor tried to do the same, but the ashes blew into the Daimyo’s eyes, so he threw him into prison; when he was let out, his village would not let him live there anymore, and he could not, with his wicked ways, find a new home.